That’s right, you read correctly, this is a NO SEW Elvis costume. 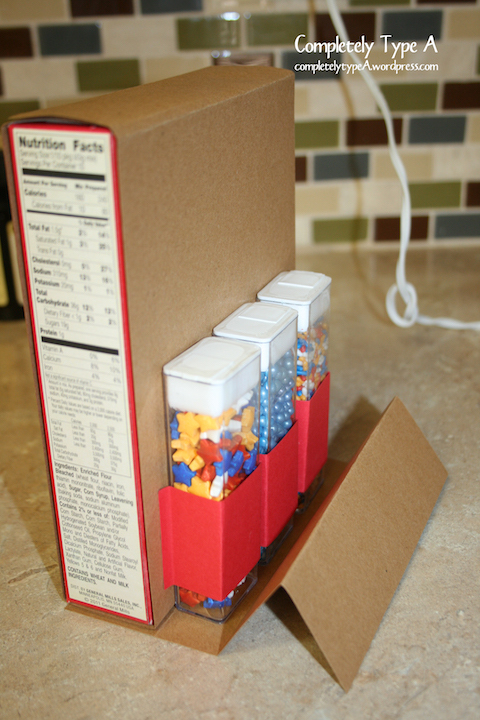 I used my hot glue gun to put it together. It was a late night, last minute, one hour project, using my cell phone to take pictures… So you get what you get. Now, if you’re looking for a durable costume to last you for years to come, for heaven sake, pull out the sewing machine and sew wherever I say glue. BUT, if you know your kid is only going to wear this once or twice, and you don’t care if it lasts that long, follow my lead, my friends. I started out with a long-sleeve onesie and a pair of white leggings from Target. I went looking for plain white, but the only ones I could find had little gold dots on them. Luckily, this worked with the costume. You’ll also need red felt, stiff white felt, red and gold glitter glue, gold elastic, Velcro dots, sequin, and most important, a glue gun. Step 1: Cut a slit in the front of the onesie starting at the middle of the collar. Turn the onesie inside out and fold the side back and glue down with hot glue. Be careful that your glue doesn’t go through both layers. 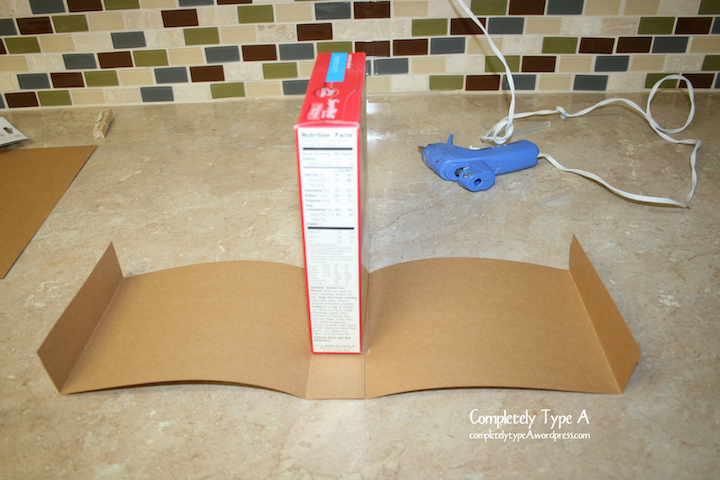 Place cardboard in between to be safe. Step 2: Glue a piece of red felt over the “V” shape you’ve created. Again, be sure your hot glue only goes through the one layer of fabric. Step 3: Still turned inside out, do the same thing with each of the sleeves. Step Four: Turn the leggings inside out and do the same to each of the legs. Go along the side of the leg that will face out. Step Five: Cut a piece of stiff white felt for the collar. 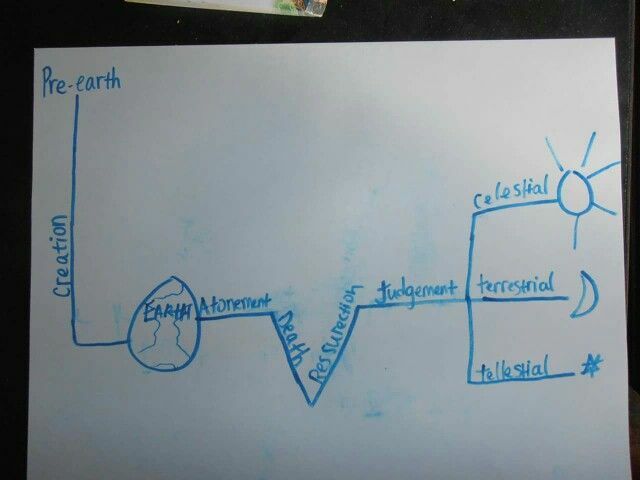 Honestly, this was the trickiest part for me. Getting the shape of the collar was hard. Once you’ve got a shape that works for you, glue the edge along the back of the onesie collar. Step Six: Time to bedazzle! Decorate the collar and sleeves with sequin and glitter glue. I attached the sequin with glitter glue also. Notice the zip lock bag in between the fabric so that it wouldn’t go through to the back. 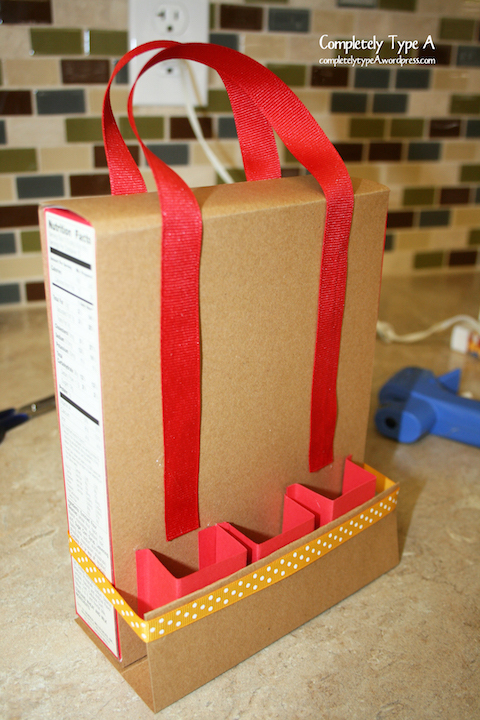 Step Seven: Glue Velcro dots onto your gold elastic for the belt. All done! Don’t forget to gel your baby’s hair in a slick Elvis curl! Happy Halloween! 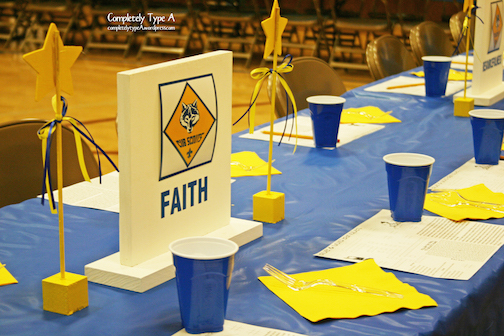 I had the task of decorating for our Cub Scout Blue and Gold dinner. We didn’t have a specific theme, just blue and gold, which made it pretty easy! I went to Party City and got the disposable plastic table coverings (100 foot roll) and all the paper products. I used these amazing games as the place mats and had pencils out on the tables also. 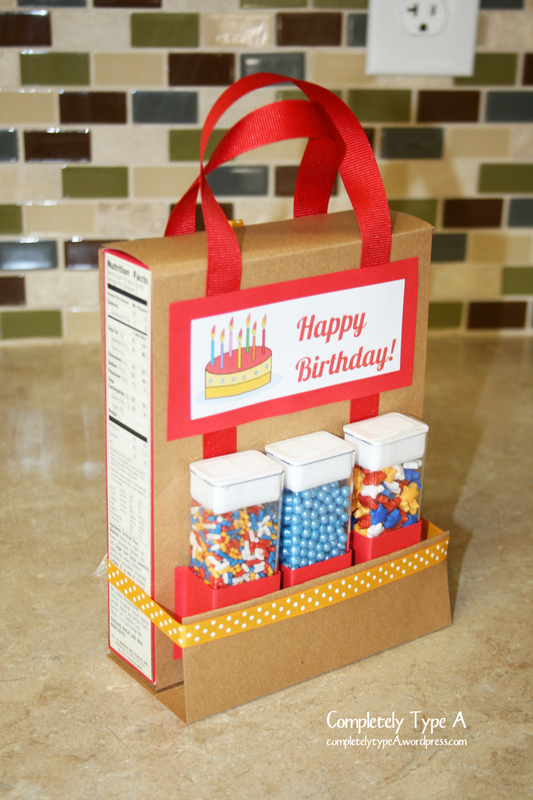 Thank you Akela’s Council Blog for your hard work! 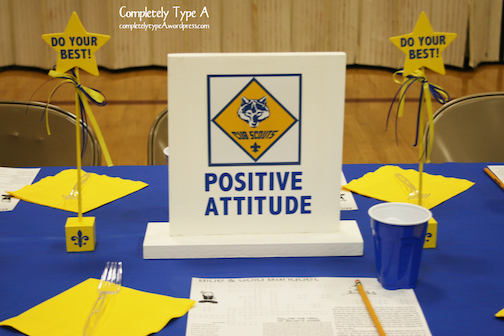 For centerpieces, I used these wooden stands from a previous project and added vinyl with my Silhouette. 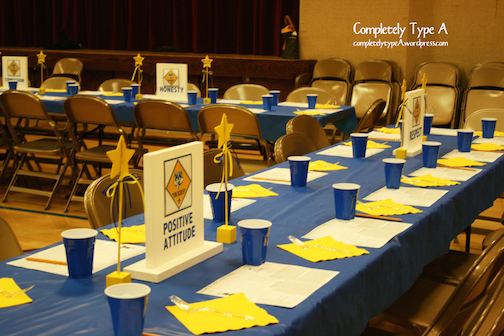 I used the 12 Core Values of Cub Scouts and labeled each centerpiece with a different value. 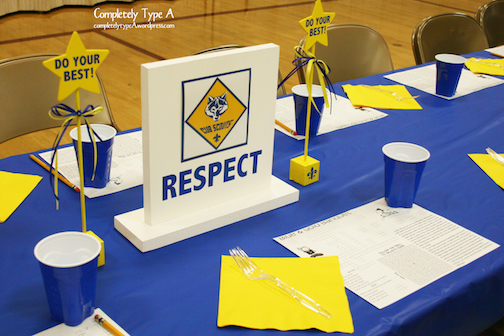 I printed off the Cub Scout logo and taped them on the centerpieces with painters tape. 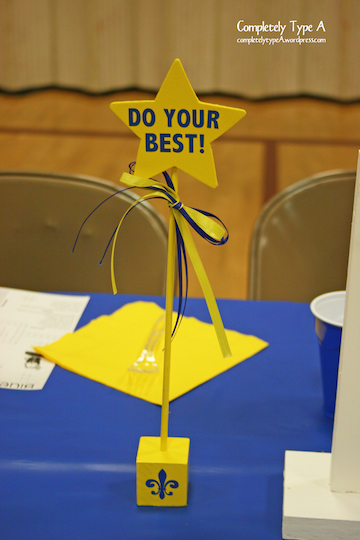 The gold stars on sticks doubled as decorations and trophies for the awards for the cake decorating (all the boys got one). I got the pre-cut stars and a pack of dowels at Joann’s, and had the Hubs cut a 1×1 stick of wood into squares. In one of our den meetings, the boys painted everything yellow and I added the blue vinyl and ribbon. The best part about these is they were about 35 cents each to make. Not bad! We organized the eating tables in a “U” shape. At the top of the “U” we positioned the flag stands, the food tables, and the cake tables. It looked fabulous and everyone had a clear view of the front. Sorry, this is the best picture I have of the table set up. It all worked out great, a pretty fun night! 1) Cut 1×4 wood into 5.5 inch pieces (or whatever size you want). 2) White wash the wood with two part white paint and one part water. Paint all sides and front and back. 3) While drying, cut vinyl. This is a Silhouette shape sold on their website. 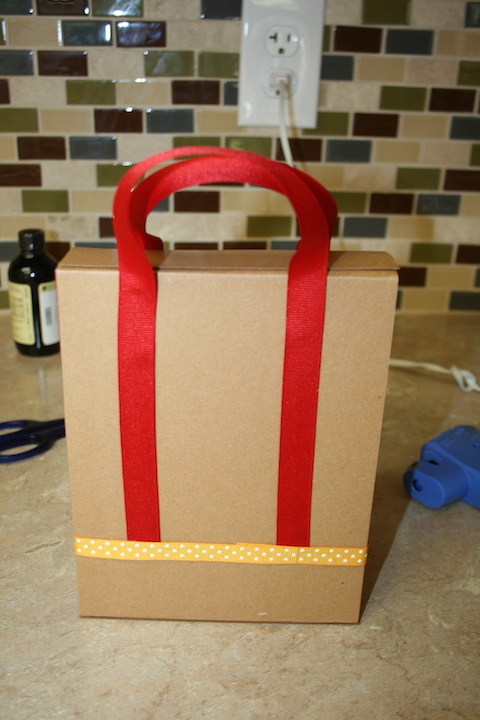 4) Apply vinyl to wood when paint is dry. So easy and less than a dollar each! With soccer season coming to an end, its time to acknowledge the efforts of our players and say thank you to our coaches… BUT I think trophies and plaques are super lame. 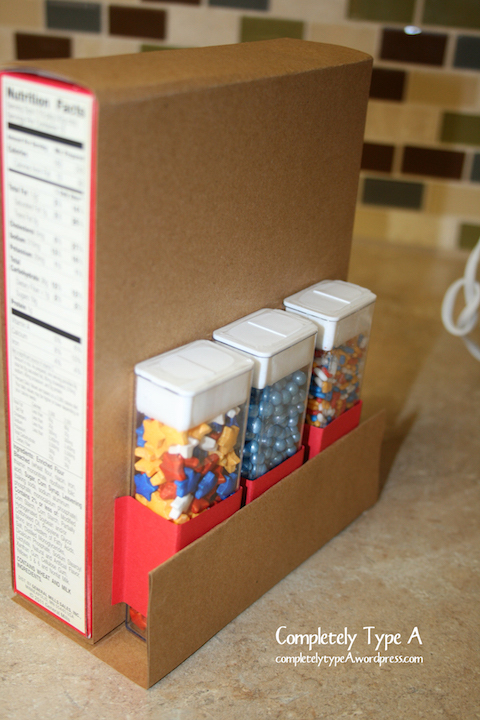 They sit on a shelf and are usually made of super cheap plastic. 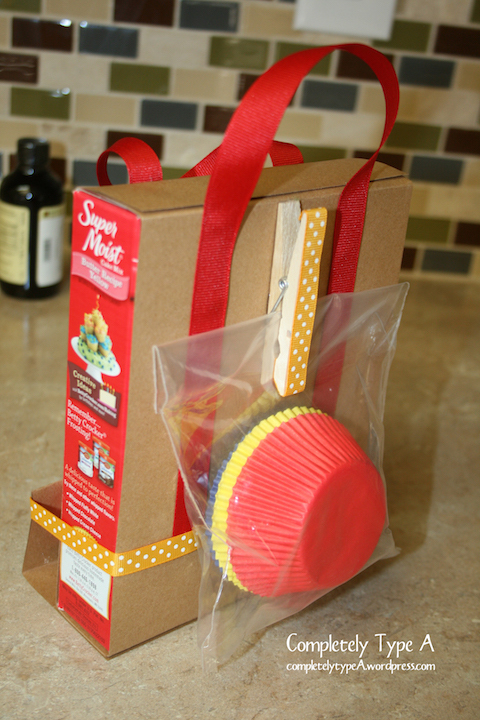 I like useful gifts! 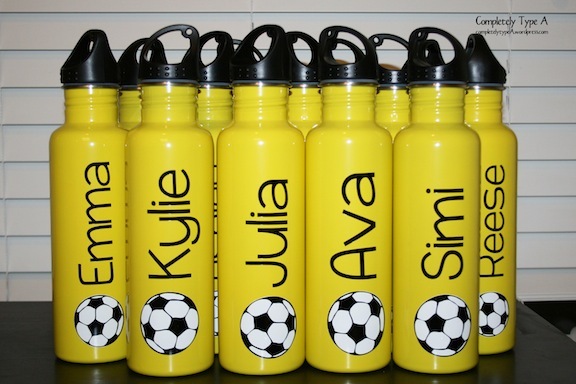 For my daughter’s team, we decided to do water bottles for the girls. All the returning players will have them for next year. 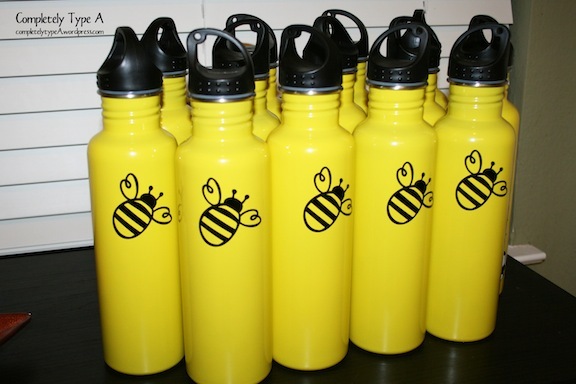 SInce we are the Bumble Bees, I got yellow stainless steel bottles and used black outdoor vinyl. The stainless steel water bottles I got at Discount Mugs. 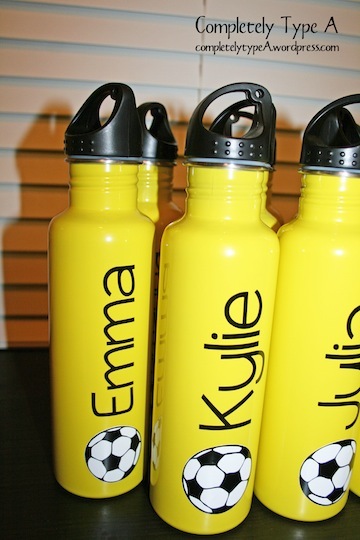 Out the door with shipping and tax, the bottles were $5.50 each (be sure to google for coupons). 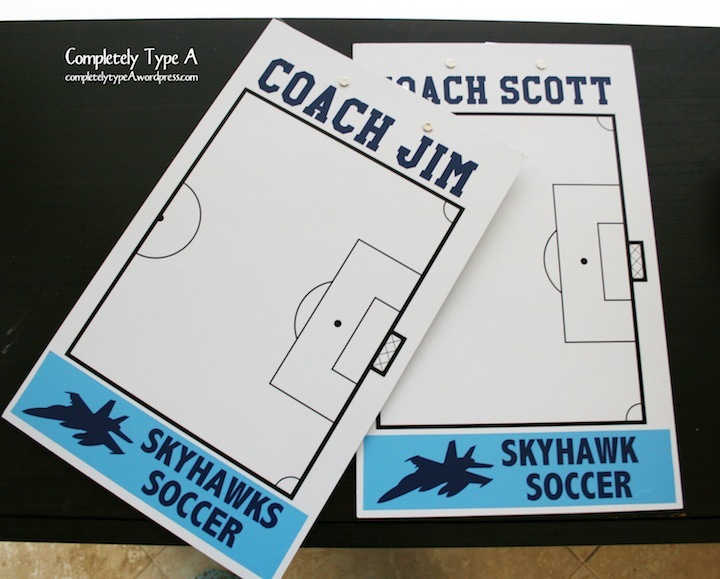 For my son’s team, I made these dry erase clipboards for the coaches. I got the clipboards off Amazon and then personalized with indoor vinyl. Its not pictured, but the other side of the clipboard also has a full soccer field printed on it and dry erase marker.